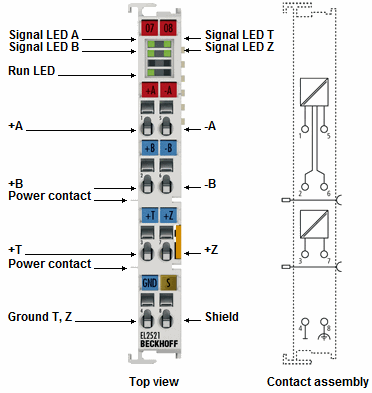 The EL2521 output terminal alters the frequency of a binary signal and (electrically isolated from the E-bus) outputs it. The frequency is preset by a 16 bit value from the automation unit. The output stage is RS422-compatible. In the version EL2521-0024 it can be driven with 24 V DC signals. The terminal indicates its signal state by means of light emitting diodes. The LEDs are driven in time with the outputs and each displays an active output.